Vocational and trade schools in Ohio gives students an alternative to attending a four-year college or university, while still providing the quality education students need to get ahead. Vocational training is delivered to students on the secondary and post-secondary levels—and in both cases, many are taking advantage of programs that will give them practical and technical skills employers are looking for. 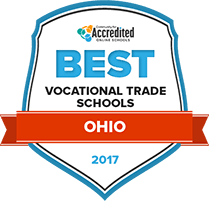 This page outlines vocational and trade schools in Ohio with information on the types of programs available to students, career outlook for graduates, and resources for finding the right program. Ohio's vocational and trade school offerings are spread across the state and welcoming students. Through our rankings, students can see the various types of community colleges and vocational institutions that are training students to compete in some of Ohio's growing industries, such as healthcare and construction. The rankings list includes on accredited schools, as well as those that have placement services for grads. Sinclair College offers job-related associate degrees across four sectors: health sciences, business & public services, science, mathematics and engineering. Even the liberal arts, communications and social sciences division has associate degrees that allow students to transfer right into the workforce, if they choose, such as with the interior design degree. Students who need to take exams to enter their field will be prepared to do so. The school focuses on helping students apply critical thinking and creative problem solving to their chosen profession. The programs are made up of general elective courses like English and art, but mostly courses are related to the chosen career. At Belmont College, students can pick from job-related programs like information technology, industrial trades, nursing/health sciences and public safety. The school offers 25 different degrees. It offers associate programs that will prepare students to enter the workforce, and degrees that prepare students to transfer to specific four-year institutions. The college focuses on helping students change careers or gain more knowledge. The school prides itself on giving a holistic education that focuses on cultural, emotional, physical and intellectual development of its students. The institution focuses on the team-building aspects of education, and fosters a culture of self-evaluation. In addition to core job skills that will make students highly employable, students will learn creative and critical thinking. At Stark State College, prospective students can study various hands-on careers: business, education, engineering technology, health, human and public services and information technology. The school offers a number of highly focused associate degrees, like the accounting services for health administration major. The school even allows paramedics to enroll in an RN associate degree geared for capitalizing on the skills they have already obtained. Over four semesters, students take courses in technical courses related to their chosen career goals and non-technical courses that cover general education. At Cincinnati State Technical and Community College, students who want a two-year degree in a job-related field can choose between the business technologies division, the center for innovative technologies and the health and public safety division. Students typically take classes in their chosen field in the first semester. Students can also choose from a list of electives within several key areas like math and English. In many programs, there are also several electives within the main field of study so students can better customize their education. At Stark State College, students can choose from several program options for vocational-related careers: business, education, engineering technology, health, human and public services and information technology. The school offers a number of highly focused associate degrees, like the accounting services for health administration major. The school even allows paramedics to enroll in an RN associate degree geared for capitalizing on the skills they’ve already obtained. Over four semesters, students take courses in technical courses related to their chosen career goals and non-technical courses that cover general education. Vocational and trade schools in Ohio are designed to deliver education based on career fields. In Ohio, there are sixteen career field categories that include areas such as health science, finance, construction, information technology, arts and communication, and manufacturing. The search tool below can help prospective students choose schools and programs that meet their career goals. 99 percent of Ohio vocational students on the secondary school level graduated in 2013. Those who enroll in health science vocational programs take coursework in topics such as medical terminology, psychology, anatomy, clinical laboratory techniques, and nutrition. Students at Auburn Career Center in Painesville earned 826 CTE credits in 2014 that were applied to postsecondary school degree programs. As a result, these students saved $90,844 in tuition charges. Ohio has 70 public schools that solely offer vocational programs, along with 52 public community colleges that have career and technical programs. Students in vocational programs in Ohio earn credentials that are recognized in the fields they want to pursue for future jobs. In order to make it easier for students to complete trade certificates and associate degrees, the state has implemented initiatives, like credit transfer programs, that allow secondary school students to take courses that can be applied toward their college-level studies. The table below includes data on the credentials that are earned by Ohio’s vocational students and compares them to the national averages. Ohio students choose certificate and degree options at a rate very close to the rest of the nation. According to the Ohio Bureau of Labor Market Information, between 2012 and 2022, Ohio is expected to see a 166,200 increase in available jobs for those in healthcare related fields—and many of these positions can be filled by vocational school graduates. For example, those who complete associate’s degrees can pursue jobs as registered nurses, physical therapy assistants, and dental hygienists. Also, vocational school students who earn certificates that take a year or less to complete gravitate toward nursing assistant and licensed practical nursing jobs. More information about the vocational jobs with the most openings in Ohio can be found in the table below. Students who attend Columbus State Community College have a number of vocational program choices that prepare them for various jobs. For example, in the business cluster, students can earn certificates and associate’s degrees in areas like marketing, accounting, hospitality administration, real estate, and logistics. Also, the mechanic and repair technologies cluster includes programs in aircraft power plant technology, avionics maintenance technology, and mechanic and repair technologies. Another trade school in Columbus is the Bradford School, which has healthcare related programs for those who want to earn physical therapy assisting and veterinary technician certifications. The school also has programs in graphic design, culinary arts, data processing, and hotel administration. When completing programs at vocational institutions like the Bradford School and Columbus State Community College, students get the training they need to enter one of the key industries in Columbus. For example, the manufacturing field in the city has 1,700 companies, like EveryWare Global, Inc. and the Whirlpool Corporation, which employ 85,000 workers. Also, the science and technology sector has 61,500 employees who work for companies such as Abbott Nutrition, IBM, Alliance Data Retail Services, and AT&T Inc. This report provides comprehensive information on the job outlook for different professions in Ohio. Provides information about the state’s CTE clusters, including course titles and descriptions. This page of the Ohio Department of Higher Education’s website includes a list of vocational schools around the state. This organization supports the educators who provide vocational education in Ohio. Includes data on projected job growth in different industries, such as the agriculture, service, and education sectors.